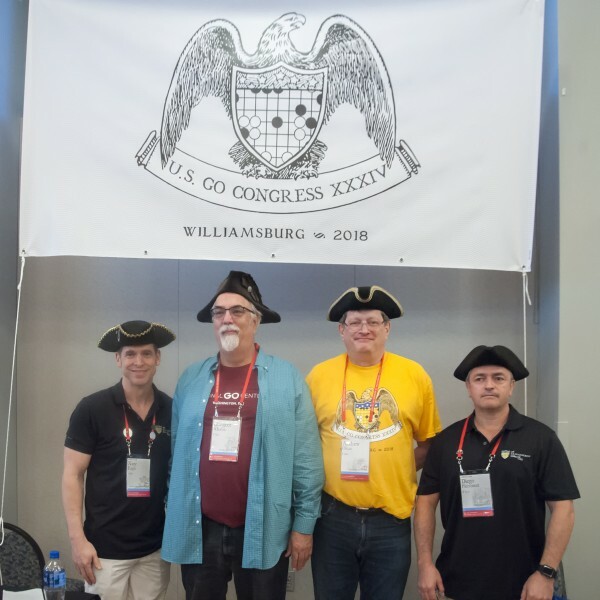 Being co-directors of the 34th annual U.S. Go Congress is the biggest, hardest thing we’ve ever done, and the generosity of attendees in encouraging us has been tremendously meaningful. But the thing we feel, more than anything, is immense gratitude toward the huge team of volunteers, from our core team to all the people who showed up out of nowhere, ready to work, who made the event possible. Anchoring our core team were Gary Smith, the registrar who made it all possible, Gurujeet Khalsa, whose creation of the first-ever official Go Congress app was such a huge success, Todd Heidenreich, the treasurer who also served as a font of institutional knowledge throughout the week, and I-Han Lui, who managed the pro schedule and was vital with many details of Congress operations. We are also particularly proud of the National Go Center regulars who played big roles this year: Nathan Epstein, who, working with Xiaocheng (Stephen) Hu on broadcast, took the tech operations of the Congress and the E-Journal team (managed as usual by Chris Garlock; look for his Congress EJ team acknowledgements tomorrow) to new heights, Joel Cahalan, who provided vital Ruby on Rails experience to craft the first-ever SMS pairing notification system, which will now be passed to future Congresses, and Eli Ferster, the assistant registrar who could handle anything. Daniel Zhao helped in dozens of vital ways throughout the week. Doug Wilkinson (left) poured sweat and, on at least one occasion, blood into the incredibly difficult task of managing the Congress’s substantial equipment needs. It was also Daniel and Doug’s first Congress! 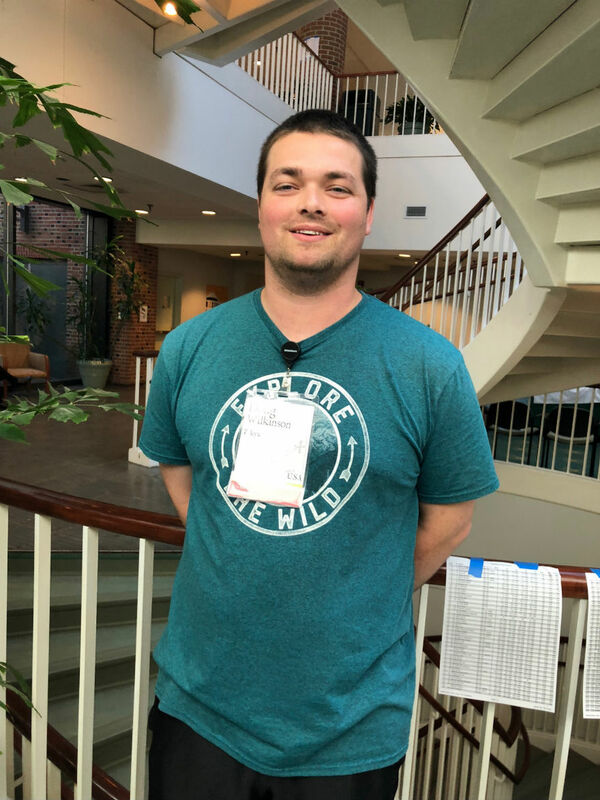 Andrew Hall performed amazingly in his first year directing the U.S. Open, and his assistant TD, Dan Ritter, was up early every single morning or the last to leave at nights, making sure that players had ready clocks and orderly tables to waiting for them. Josh Lee directed a tremendously exciting U.S. Masters tournament in his first outing. Big thanks to tournament directors Steve Colburn, Keith Arnold, Peter Schumer, Andy Olsen, Lisa Scott, Jim Hlavka, Neil Ritter, Justin Teng, Terry Benson and Todd Heidenreich. And a particular thanks to Greg Kulevich, director of the Seniors Tournament, who worked hard this week, giving up most of his own Congress experience to make one of the biggest tournaments of the Congress a success. Thanks to our excellent translators, Jonathan Hop and Satoru Inoue. Huge thanks to Devin Fraze, who ran the wonderful youth room, and Paul Barchilon, to whom Devin passed the baton at the end. Thanks to James Pinkerton, Qucheng Gong, and to Facebook, for bringing OpenGo to the American Go community this year: over 66 players got the chance to personally play and learn from the strongest open-source Go AI in the world, and over 10,000 people got to tune in and watch Andy Liu and Ryan Li play Pair Go with OpenGo as a teammate. 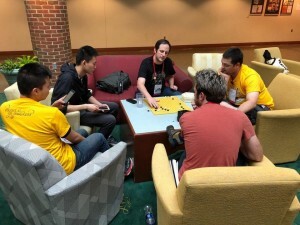 (It was a particular honor for Nate to get to be one of the hands of OpenGo as Andy’s partner.) And thanks to the volunteers who made the simuls possible by serving as the eyes and hands of OpenGo, which was not an easy job: it required multiple hours of back-straining, brain-draining effort. You did great. Thanks to the people who showed up early on Friday to help us get everything set up and to help on registration morning, among them Chris Kirschner, Marianne Palhamous, Lee Schumacher, John Grenier, Ted Terpstra, Mark Nahabedian, Wayne Nelson, Keith Arnold, Patrick Bannister, Kristal Soo, and so many more. Particular thanks to Neil and Dan Ritter, who assembled the two giant monitors that became the center of the Congress experience, and then disassembled them again so they can travel to next year’s Congress in Madison. Thanks to Lisa Scott for managing the AGA meetings and for working to bring us the first year with an official Code of Conduct, a hugely valuable tool for making the Congress a welcoming place for everyone. Thanks to the front-desk staff at William and Mary—all students—who handled the largest group they’d ever had come through with kindness, patience, and helpfulness. We will have inevitably missed people—please know that no matter what it was, your contribution toward making Congress happen was essential and appreciated. Thank you, and we hope to see everyone next year in Madison! photos: top right: Nate Eagle (left) and Diego Pierrottet (right) with the National Go Center’s Gurujeet Khalsa (second from left) and AGA president Andy Okun (second from right), photo by Phil Straus; bottom left: Doug Wilkinson, Equipment Manager and first-time Congress attendee, photo by Nate Eagle; bottom right: Masters TD Josh Lee teaching go.